Ilyse Hogue, a social change practitioner, media consumer and analyst, and online engagement expert, is the president of NARAL Pro-Choice America. Previously, she served as Co-Director of Friends of Democracy, a 2012 initiative to build political power around the issue of money in politics and as Senior Adviser to Media Matters for America where she focused on advocacy programs to undercut the power of right-wing media. From 2006- 2011, Ilyse was Director of Political Advocacy and Communications for MoveOn.org. In her over five years at MoveOn, she was responsible for shaping political strategy and developing communications initiatives to give MoveOn's five million members a voice in Washington. An expert in both electoral and advocacy campaigns, she has mobilized MoveOn members and worked closely with leaders in Congress and the White House to advocate for progressive legislation on financial regulatory reform and health care. In these capacities, she has served as a spokesperson to the media, frequently analyzing breaking news on both televisions and in print. Prior to joining MoveOn, Ilyse was Program Director at the Rainforest Action Network, where she spent six years pioneering and implementing corporate advocacy campaigns in the banking, forest, and other sectors. She was the recipient of the Business Ethics Network award in 2005 for her work in the financial sector, a campaign that was ultimately instrumental in moving over 60 multinational banks to adopt a groundbreaking framework of environmental standards for private investment known as the Equator Principles. These principles led to a host of voluntary initiatives in the US banking sector, including from Goldman Sachs, Citigroup, JP Morgan Chase and Bank of America. Ilyse was the chief negotiator in each of those agreements and worked to market them to a spectrum of constituencies, from institutional investors to environmental NGOs. A Harvard Business School case study was written in 2005 about this work, and she has lectured on it at Yale and Columbia. She has been a frequent speaker and writer about corporate power, corporate accountability and multi-national institutions that govern financial and corporate behavior. Ilyse was very involved in the global justice movement, traveling from Seattle to South Africa and many places in between working with international allies on corporate power. She is the co-founder of smartMeme Strategy and Training project which works to amplify the impact of grassroots organizing with new strategy and training resources, values based communications, collaborations, and meme campaigning. Ilyse serves on the board of Rebuild the Dream, Oil Change International, Story of Stuff, and National Domestic Worker's Alliance. 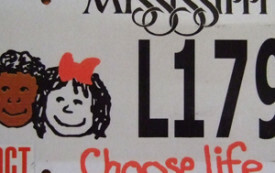 Ilyse holds an M.S. in Resource Ecology Management from the University of Michigan where she studied the impact of resource constraints in politics and culture. Her BA is from Vassar College. 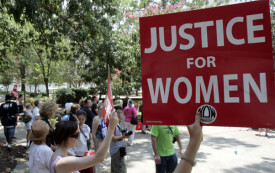 After November 4, America could follow Texas down a very anti-woman path. In the eyes of Texas, one woman is now nothing more than a machine. 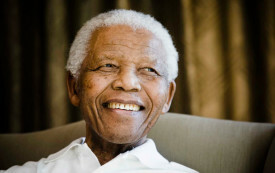 Few people know that Mandela was a global leader on reproductive freedom. Anti-choice Republicans are using the threat of a government shutdown to—surprise, surprise—renew their attacks on women. The fake clinics posing as “crisis pregnancy centers” lie to women and shame them, and are supported by extreme politicians and sometimes even taxpayer dollars. 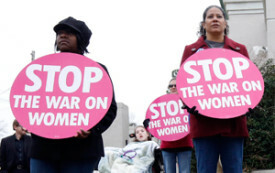 Susan B. Anthony List: The NRA of the Anti-Choice Movement? 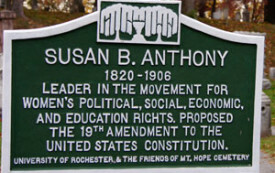 Susan B. Anthony fought her whole life for women’s rights. Now a group using her name wants to win elections to roll them back. 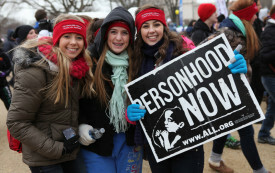 As we mark the fortieth anniversary of Roe v. Wade, how far have we come? And how far do we have to go? With women’s issues so prominent this election cycle, it’s a mystery why they were invisible in Wednesday’s debate. A Romney presidency would rob progressive movements of the oxygen required to grow deeper and broader roots.